What defines a legacy? For most athletes it’s the numbers on the back of their player cards that usually justifies their greatness. But for the truly great, the cream of the crop, stats aren’t enough. Peyton Manning is one of those athletes. If you were to judge him on statistics alone, without question he is the greatest quarterback in NFL history. However, after being named the NFL’s most valuable player for the fifth time in his career, Manning would enter Metlife Stadium with the chance for NFL immortality. A few hours later, the almighty quarterback looked like something we haven’t seen in 2013, a mere mortal. Losing is one thing, but what the Broncos did was an even bigger disgrace, they didn’t show up. Can someone check did they even get off the plane or bus? Despite two weeks to prepare, the Broncos didn’t even put up a fight. Sure, the botched snap resulting in a safety swung momentum early, but despite two early trips to the red zones the Broncos still were only down 8-0. The stage was set for Manning, a chance to come back and prove his greatness to the world. But that didn’t happen. Manning’s turnovers at key moments of the game would finish off the illusion of a comeback as the Broncos were embarrassed by a 43-8 whopping by the Seahawks. 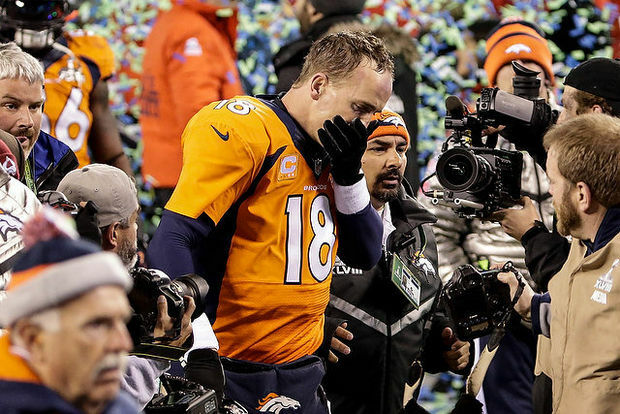 Once again, Manning, the best quarterback in the game fell short. This time he didn’t fall short, he tripped right out of the gate and seemingly damaged his reputation in one game. It doesn’t matter how many yards, touchdowns, or wins Manning has in his career. The only way to exorcise the critics or questions about his legacy is to hoist another Lombardi trophy. But now at the age of 38, with already declining health, Father Time is catching up to Peyton Manning. If he wants to be considered the greatest quarterback ever the only way to do this is to win another Super Bowl. When you are the best in the sport you are expected to win. Is it fair? Not necessarily but it is expected. With such a miserable performance on his resume, and millions of NFL fans who are upset about the lack of a game on the field, Manning needs a win so that people forget this. If not, it will be the defining moment in a career of futility and what could have been. He might be a great quarterback, but Manning’s post season demons are keeping him from being one of the greatest players in NFL history. Next Michael Sam: I’m Gay! And I’m going to Play!